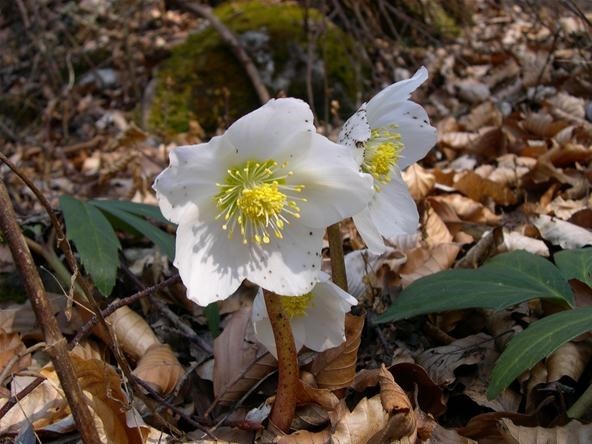 A hellebore is any of the approximately 20 plants from the genus Helleborus, many of which are poisonous. Hellebores are herbaceous perennial flowering plants from Eurasia related to the buttercup family, having showy flowers with petaloid sepals. One particular species (Helleborus niger) flowers during the coldest, shortest days of winter. It is referred to as the Christmas rose, despite not belonging to the rose family. The name comes from an old legend that says it sprouted in the snow from the tears of a young girl who had no gift to give the Child Jesus in Bethlehem. Christmas rose is also called black hellebore, because of the color of its roots. Its poison has an acrid taste and can cause burning of the eyes, mouth and throat, oral ulceration, gastroenteritis, and hematemesis. In the past, the roots and rhizomes of black hellebore were used for the treatment of edema, amenorrhoea, nervous disorders, and hysteria. It was also once thought to cure insanity. Because it is so toxic and its medicinal value has not been proven, it is not recommended for use. In the early days of medicine, "black hellebore" was rumored to cause tinnitus, vertigo, stupor, thirst, with a feeling of suffocation, swelling of the tongue and fauces, emesis and catharsis, slowing of the pulse, and finally collapse and death from cardiac paralysis. Today, the Christmas rose is used mostly for flower decorations during Christmastime. * Only acceptable in Scrabble play outside of North America.